Until recently, I never considered using an eye cream. However, the effects of staring at my laptop screen and several late nights, coupled with the fact that I’m now closer to 30, have left me with dark circles and a few fine lines. Since I would like to prevent (or at least slow down) the aging process, I decided to get my hands on the Clinique Pep-Start Eye Cream. Here is my review. 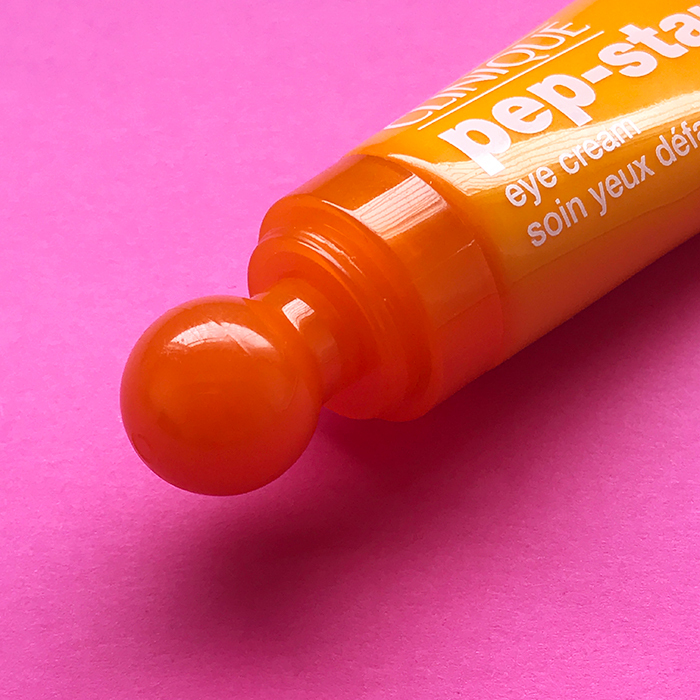 Unlike every eye cream I’ve spotted till date, this one comes in a fun, bright orange tube. Usually, formulas intended for this area comes in serious-looking glass pots or clean, white tubes so the packaging of this cream was a pleasant surprise. Once you take off the clear cap, you will notice that the tube has a round ball applicator. To use, simply pop up the applicator and squeeze out the formula. The round tip is intended to depuff eyes, however, since it is made of plastic it doesn’t really cool the skin or reduce swelling. The directions for use and ingredients are printed on the back of the accompanying box. On the formula front, this eye cream was exactly what I was looking for. The lightweight consistency allowed the cream to glide on to my skin smoothly. Since the area under the eyes is thinner than the rest of your face, I really appreciated the fact that this formula did not tug at my skin at all. The minute I applied it, my skin felt instantly hydrated. Another major plus point is that the cream sank into my skin within a few minutes, without leaving behind any residue or stickiness. The formula is fragrance-free. I’ve been applying this eye cream for over 2 months now and have been pretty happy with it. It works well to keep the area under my eyes plump and hydrated. Although I use it mostly at night, I’ve found that the formula is great to layer beneath a drying or matte concealer. Since the cream absorbs quickly, it doesn’t cause any creasing or pilling of my base makeup. The only downside is that it hasn’t made a difference in the intensity of my dark circles. Weightless, gentle and hydrating, this eye cream is the perfect beginner product for those of us who are inching towards 30. Now, all I need is a magic cream to erase my dark circles!